We believe that our patients are the best judges of the quality and service of our dentistry in Chicago, Illinois. Read what our patients are saying about us below. As you know, it took me a long time to decide to make the switch to Lumineers, but I’m very glad I did. The contrast between my original teeth, which were becoming increasingly worn down and discolored, and the Lumineers is striking. The end result, as you predicted, is that I now look (and feel) younger. Above all, however, it is comforting to know that my teeth are now better protected from further erosion.Thanks to your careful preparation, my “new” teeth look better than ever, the shade of white you recommended looks very natural, and I am enjoying a more radiant “Lumineer smile.” You did a beautiful job of placing the veneers, and I am very pleased with the result! I can't begin to THANK YOU enough for my 10 LUMINEERS! I can't wait to get my lowers done NOW! I have a broad smile and I was insecure about smiling but, now I'm constantly smiling. My friends and family compliment me all the time on my new SMILE. I just LOVE IT! 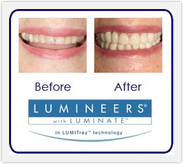 I would recommend LUMINEERS to everyone I know, they are pain free and LIFE changing!!! know that Julia will write to you in a few days. I wanted to write to you to thank you for the wonderful work you done on my daughters teeth. The Lumineers allowed her to have a smile. For most of her life, she would not show her teeth when she smiled. When she left your office today she could not stop looking at herself in the rear view mirror! When she was jumped almost two years ago and had both of her front teeth badly broken. I was at a loss of what can be done for her. The work you did with the Lumineers was what was needed.